Wirtshaus Zamdorfer has existed since 1928 and is a traditional and friendly neighbourhood beer garden where most guests are regulars from around the Bogenhausen area in the eastern part of Munich. The beer garden is partly shaded by chestnut trees and sun umbrellas. The serviced and self-serviced areas are divided equally with about 250 seats in each section. 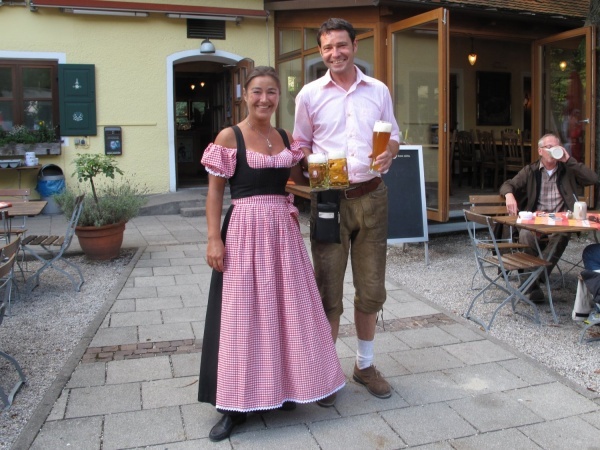 The restaurant as well as the self-service canteen offer Bavarian specialties prepared by the one and same kitchen. The Spaten Hell (lager) served from the tap is sold at €7.40 p/Maß (May 2015). Tip: Complete the regular's membership application for a chance to win a “Weißwurstfrühstück” every month - a white sausage breakfast which according to Bavarian tradition should not be consumed past midday. The self service food stall opens at 5pm everyday and closes at 11pm sharp! The restaurant is open between 11am and 1am everyday. Before 5pm guests of the self-serviced area can fetch their beer from inside the restaurant building.